Gaby Zakuani will leave the Cobblers this summer after the player and club failed to agree terms over a new contract. The central defender was offered a deal at the end of the season, with the Cobblers taking into account the player will miss a chunk of next season due to international commitments. Zakuani is the captain of the Democratic Republic of Congo, who have World Cup qualifiers against Tunisia on August 27 and September 1. The 30-year-old was away on international duty three times last season, and suffered a hamstring injury at the Cup of Nations in January. Town boss Justin Edinburgh wanted to keep the former Peterborugh United man, and said last week: “We are ongoing with Gaby, in terms of length (of contract) and finances. “The big thing for me is Gaby’s international situation, and we are trying to come to a conclusion and an agreement on that. 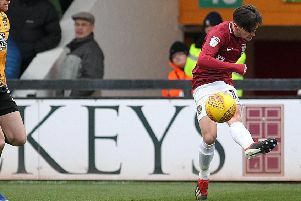 Despite lengthy talks, the club and Zakuania have failed to agree terms and he will now look for a new club when his Sixfields contract expires in June. “We have been speaking to Gaby and his agent to try and get comfortable with his level of international commitments. Unfortunately we are unable to do that.” said Justin Edinburgh. Zakuani took to Twitter to make it clear that the failure to agree terms on a new deal was nothing to do with a ‘club v country’ row. “Thank you @ntfc players, staff & fans,” wrote Zakuani. “Gutted we didn’t find common ground but that’s football, once again thank you #ntfc. Zakuani made 24 starts and one substitute appearance for the Cobblers, scoring two goals, although he played just twice in 2017 due to injury.